If you are still reading this you’re my kind of person – A BELIEVER! Thanks for reading past that first line. It is not a joke, it is actually the fulfillment of a Talmudic adage, “each and every penny adds up to a large amount”. How do I know this can work? Because I have been doing it for the last five years and we now generate $thousands$ in monthly donations! 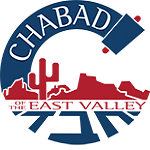 Thank G‑d as Chabad has grown and our budget has grown (2008-2009Fiscal year $375,000) $the thousands$ is just not sufficient to cover the Chabad Hebrew School, Camp Gan Izzy, The Synagouge, Chai Kids Club, Bat Mitzvah Club, Holiday Programs, Social services, etc.. So, I am turning to you to join our Chai Club. Pick a dollar amount in multiples of CHAI – LIFE = $18 ($18, $36, $72, $150, $180, $1,800,000, etc.) and we will set you up on an automatic monthly charge. You can always increase it or decrease it. BE A PARTNER IN OUR VALUABLE WORK AND COMMUNITY!